Product categories of Chemical Tanker, we are specialized manufacturers from China, Chemical Tanker, Chemical Fuel Tanker suppliers/factory, wholesale high-quality products of Chemical Liquid Transport Tanker R & D and manufacturing, we have the perfect after-sales service and technical support. Look forward to your cooperation! Chemical liquid truck is widely used in loading and unloading of acid, alkali, salt and other corrosive, medium risk.Chemical liquid transport tanks material could be selected according to the need of carbon steel, carbon steel lined with polyethylene(PE), stainless steel, polyethylene(PE) tank, Aluminum alloy, etc. 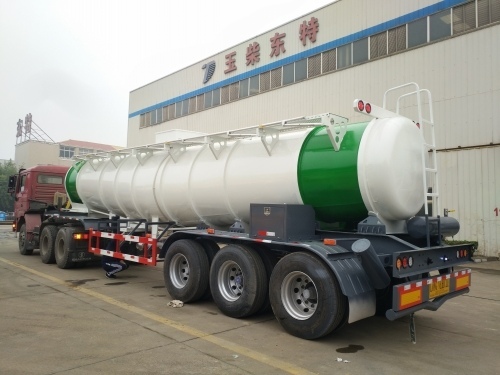 According to the different transport medium, the chemical liquid truck can be called, hydrochloric acid transport truck, sulfate transport truck, hydrofluoric acid transport truck, formic acid transport truck, acetic acid transport truck, ammonia Water Transport Truck, sodium hydroxide solution transport truck, formaldehyde transport truck, ethanol transport truck, toluene transport truck, xylene transport truck, isopropanol transport truck, dimethylamine transport .